The original Monahan Express was Thomas Monahan, Express, 187 S. 5th Ave. in 1895. South 5th Ave. is now known as LaGuardia Place and West Broadway. In 1895 it ran south from West Fourth St. to Canal St. Thomas Monahan (1860-1925) was the son of Michael Monahan (1829-? ), a laborer, who immigrated from Ireland in 1852. The Monahans appear in the U. S. Census of 1880 living at 616 Grand Ave., Brooklyn. Thomas was the eldest son (19, Clerk in Store). His brother John was 16 and worked in a shoe factory. By the time of the 1900 U. S. Census Thomas was married and living on his own on Prince St. in Manhattan. Michael Monahan was now living at 528 Carlton Ave., Brooklyn. Among the children living at this address were John, age 39, and Frank, age 24. It was these brothers, John J. Monahan (1871-?) and Francis M. Monahan (1875-1912?) 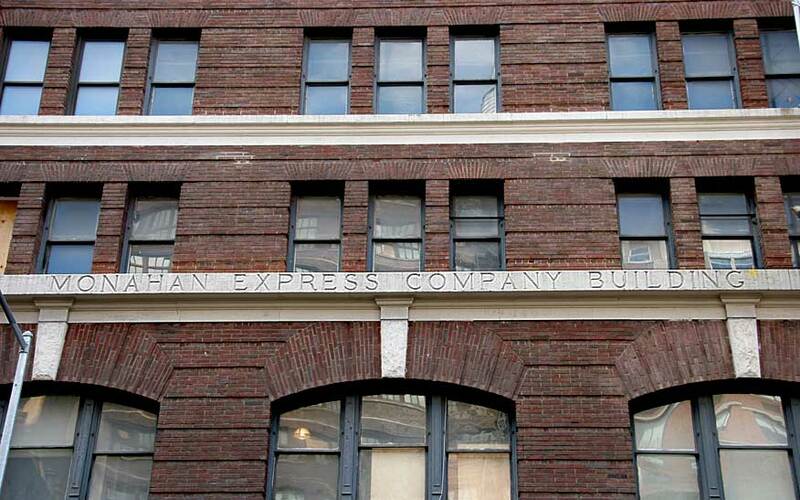 who joined with Thomas Monahan to constitute Monahan's Express Co. by around 1898. In 1911 the New York Times (11 June, p. xx1) reported that "A large deal which will result in a twelve-story loft improvement for Eighteenth Street just west of Seventh Avenue has just been concluded whereby the Monahan Express Company secures a 100-foot plot from 216 to 222 West Eighteenth Street." The structure "will be used as the main distributing station for the local express business of the Monahan Company. The concern has been located for many years in the old building at the foot of Seventh Avenue, which will be torn down in the near future to permit the extension of Seventh Avenue southward to Varick Street." By 1920 Thomas Monahan's brothers had died, and he had retired from the express business. He remained, however, president of an affiliate of the company that dealt in real estate. This appears in directory listings as the Monahan Express Co. Realty Dept. The Realty Dept. continued to appear in the Manhattan telephone directory at 216 W. 18th St. until 1967. The Express business itself seems to have left this location around 1929/30. From around 1920 to 1928 president of Monahan Express was James Joseph Riordan (1881-1929). Riordan received a prominent obituary in the New York Times at the time of his death (by suicide) in Nov. 1929. He had been active in New York political life, serving as treasurer to James J. Walker in his campaign to become mayor of New York in 1925, as well as Governor Al Smith's re-election campaign the following year. Riordan appears in the U. S. Census of 1910, age 29, a bank clerk living on West 14th St. He registered for the World War I draft in 1918 while employed as an expressman at Monahan Express Co., 216 W. 18th St. In 1920 Riordan gave his occupation as "Trucking, Owner." After Thomas Monahan's death, the realty side of the business migrated to two sisters and a sister-in-law. The sisters were Elizabeth Agnes Monahan (1870-1932) and Anna F. Kenny (1871?-?). The sister-in-law was Elizabeth R. Monahan (1877-? ), widowed wife of Francis Monahan. These 3 are listed as the officers in Monahan Express Co. Realty Dept. in Polk's New York City Directory, 1933-34. This ad for Monahan Express appeared in American Cloak & Suit Review, Jan. 1914. This ad from the same publication a year earlier boasted the advantages of locating in the Monahan Express Company Building (216-222 W. 18th St.) itself.